Tag Archive | "Barclays ATP World Tour Finals"
The much anticipated tussle for the Barclays ATP World Tour Finals trophy between the world’s top two players, Novak Djokovic and Roger Federer, was scrubbed due to injury. Djokovic took home a third consecutive title, his fourth overall, as Federer forfeited the match. Approximately an hour prior to start time, a packed arena listened to Federer apologizing for his decision not to take the court. The six time year end championship titlist was forced to pull out of today’s contest because of a back problem which surfaced in the semifinals. This was only the third time since turning pro in 1998 that Federer has pulled out of a tournament he began playing and never before in a final. The withdraws from the other matches were also provoked by an unfit back. The full stadium settled for exhibition matches which organizers scrambled to put together at the ultimate minute. Brit Andy Murray, who was ousted in the round robin round, came to the rescue by playing a set against Djokovic which the latter won. It was followed by a doubles competition featuring John McEnroe and Murray versus Pat Cash and Tim Henman. What a difference less than twenty four hours make! 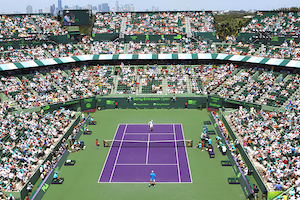 On Saturday, spectators were treated to two tantalizing matches. The drama between Federer and compatriot Stanislas Wawrinka alone was worth the price of admission. After losing the first set 4-6, Federer scrapped through the second set, breaking Wawrinka at 6-5 to push the match to a deciding set. Subsequent to breaking Federer in the opening game, Wawrinka maintained the advantage and served for his first year end final at 5-4. With Wawrinka squandering two match points, the third set victor was determined by a tiebreaker. Once again, Federer overcame two match points prior to coming out on top. Djokovic was also challenged in his semifinal match by Kei Nishikori, the man who shocked him in the semifinals at the U.S. Open this year. After being absent in the opening set and Djokovic seizing it 6-1, Nishikori persevered and took the second 6-3. However, there would be no full comeback for the Japanese as Djokovic regained the reigns in the third set. The Serb dominated 6-0 to punch his ticket into the last ATP match of 2014. With today’s triumph, Djokovic became the first player since Ivan Lendl 1985-87 to lift this trophy three years in a row. Although the ATP season is now concluded, for Federer there is still the matter of the Davis Cup. In just a few days, Switzerland will battle France in the final. 1992 was the only other occasion that Switzerland reached this stage of the competition. That year, the United States captured the win. Consequently, should Federer hoist this distinguishing prize, he will further cement his iconic status in the sport. After all, both Rafael Nadal and Djokovic, his two biggest rivals, have at least one Davis Cup title. Then, the only milestone for the Swiss to conquer would be singles Olympic Gold. Seven successive defeats had been the number for Rafael Nadal at the hands of Novak Djokovic. Today, however, on clay, Nadal dominated Djokovic 6-3, 6-1 to bank his first title of the season and his eight consecutive trophy at the Monte-Carlo Rolex Masters. It’s been a difficult week for Djokovic who was informed of his grandfather’s death hours prior to playing his round of 16 match. Yet, Nadal must have had doubts coming into this final considering he had not beaten his rival since the Barclays ATP World tour Finals in November 2010.